A vendor sells tequenos (cheese sticks) during the baseball game between the Leones de Caracas and the Navegantes del Magallanes in Caracas, Venezuela, Oct. 27, 2015. Venezuela's raucous, boozy and affordable baseball games have long provided respite from the growing gloom in the economically struggling country. Now, a more than quadrupling of ticket prices is putting a damper on the national pastime, with the season kicking off this month to sometimes half-empty stadiums and featuring players who say their per diems don't go far enough to buy lunch. On a recent game night, hard-core baseball lovers celebrating what fans call Venezuela's national religion filled about a third of the sooty stadium in central Caracas. The plaza of vendors outside had the ghost-town feel that has come to mark so much of Venezuelan life as the socialist country grapples with the world's highest inflation rate and a severe shortage of imported goods. Average attendance at the 25,000-seat arena is down 25 percent for the first month of the season. While most South Americans prefer soccer, Venezuela is crazy about baseball — even with games becoming more expensive to attend. These fans watch a game between the Leones de Caracas and the Navegantes del Magallanes in Caracas, Oct. 27, 2015. "It's not just the ticket price; it's the cost of everything you have to buy your family during the game,'' said Luis Rojas, director of Caracas' Estadio Universitario. While most South Americans prefer soccer, Venezuela is crazy for baseball. It's exported more players to Major League Baseball than any other country aside from the Dominican Republic, including several who are playing for the Kansas City Royals in the World Series this week. During the off-season, major and minor league players often come to play in the oil-producing nation. The fact that thousands of Venezuelans so far have been willing to pay the stadium's new ticket prices of up to 2,000 bolivars — a fifth of the monthly minimum wage — is a testament to their love for the game. A beer vendor drew jeers as he worked the stands after giving fans the unhappy news that the price of a 300-milliliter (10-ounce) bottle had jumped from 30 to 120 bolivars since the season ended last year, and the most popular brands had gone missing altogether. "Last year my shoes cost 2,000 bolivars and this year they cost 18,000,'' he shouted back at outraged customers. Even beer fans with money are cutting back. Radio DJ Daniel La Cruz has been limiting himself to two bottles of light beer per inning, instead of ordering a case of 36 for himself and his wife to share as usual. Below him, a couple sat together in an empty row, having decided to save money by leaving their kids at home for what used to be a family activity. Outside, T-shirt vendor Alexander Morales eyed the empty walkways. He skirts Venezuela's rigid currency controls by buying dollars on the black market to import his merchandise. Like the beer vendor, Morales took his share of abuse from fans objecting to his prices, which are up 500 percent from last year. That's about the inflation seen for other imported goods like specialty foods and electronics, but far ahead of the rates seen in taxis and street food stands. "I put my faith in God, but these are apocalyptic times,'' he said. Oscar Prieto Parraga, president of the Venezuelan Professional Baseball League, believes people are overestimating the drop in attendance. He said he and other officials were doing all they could to maintain a sense of normalcy for fans in the face of raging inflation. For many years, the country's runaway inflation seemed to hardly touch baseball. Last year, attendance was up 5 percent at major stadiums across the country, and ticket sales for the Caracas team jumped about 3 percent. Now, it's not just the fans and vendors who are being hit. Team managers say they are struggling to rent buses, pay for hotel rooms and provide basics like cups and toilet paper, which can sometimes be found only on the black market. The sport as a whole has begun to struggle under the weight of the country's mounting problems. Some recruiters from the U.S. say they have been scared away by a visa requirement the administration imposed this year amid a tiff with the U.S. This spring, the Seattle Mariners became the latest major league team to shut down its baseball academy here. 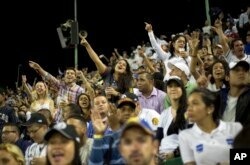 Still, a carnival atmosphere reigns among the reduced number of fans at the Caracas stadium. A man flashed a cap from an opposing team, drawing a round of jolly taunts, though not the beer throwing that used to be customary when brews were cheaper. And a samba band provided a brain-rattling drum score to every play.